Kriegar Pearlescence Damascus Steel / Mother of Pearl Pocket Knife | BUDK.com - Knives & Swords At The Lowest Prices! 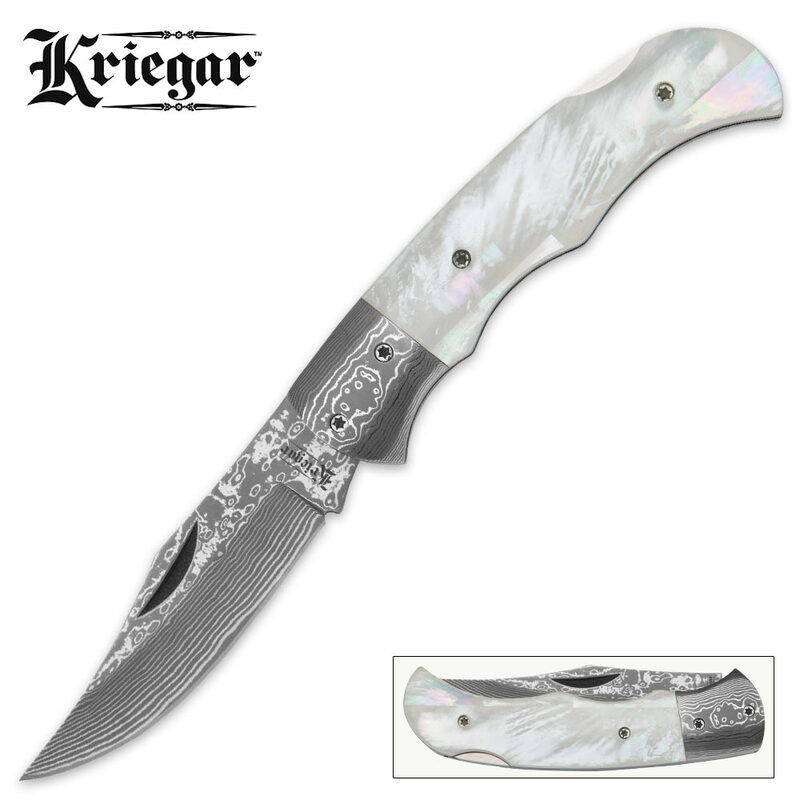 Shimmering with radiant shades of white, green and magenta, the Kriegar Pearlescence Pocket Knife is a breathtaking wonder of a folder - blade, handle, bolsters and all. The 3" clip point blade is forged from stately Damascus steel, naturally clad in dazzling whirls, ellipses and waves. The striking patterns are a result of a centuries-old metalsmithing technique that involves painstakingly firing, folding, hammering and acid etching layers of steel - over and over, sometimes for days on end. 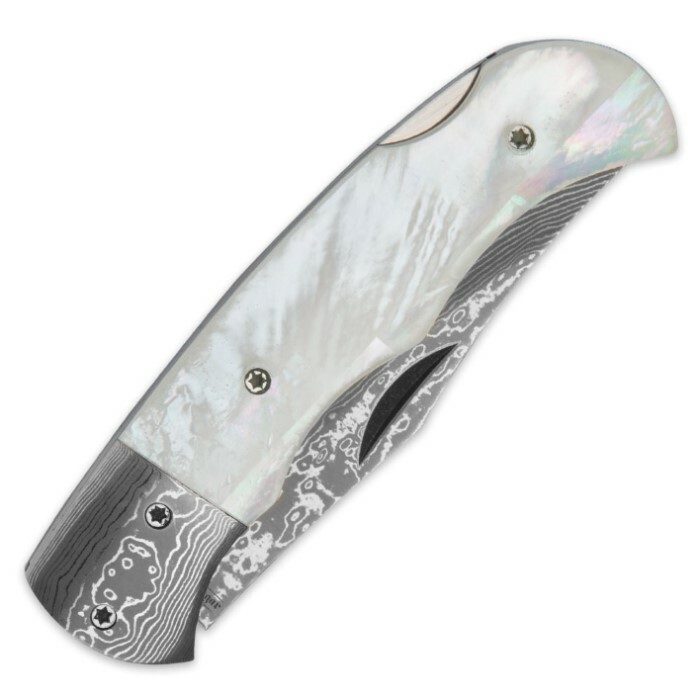 Damascus steel's rustic charm affords a smart contrast to the Pearlescene's mother of pearl handle - vivid, opulent, unabashedly showy. When turned under light, the handle flashes with opalescent fire. What, from a distance, looked like a simple canvas of pearly white, suddenly transforms into a sparkling kaleidoscope of iridescent emerald, amaranth and gold. But for all its sumptuous beauty, the Pearlescence is, at heart, a versatile everyday carry that can capably tackle practically any day-to-day cutting task you throw at it and then some. Its sturdy lockback mechanism provides added stability during demanding tasks, and the blade edge is carefully honed to razor sharp. Equally at home in your pocket or in your display case, the Kriegar Pearlescence Pocket Knife deserves a special place in your knife collection. This knife looks really nice. The Damascus blade and bolsters really stand out. From a distance, the pearl handles look good, too. However, upon closer inspection, it turns out that there is only a very thin layer of pearl in the handle which is covered by a thick piece of clear plastic. This part was disappointing. I was torn between 3 stars or 4 stars and decided to give it 4 stars because of the Damascus and it still looks good at a distance.